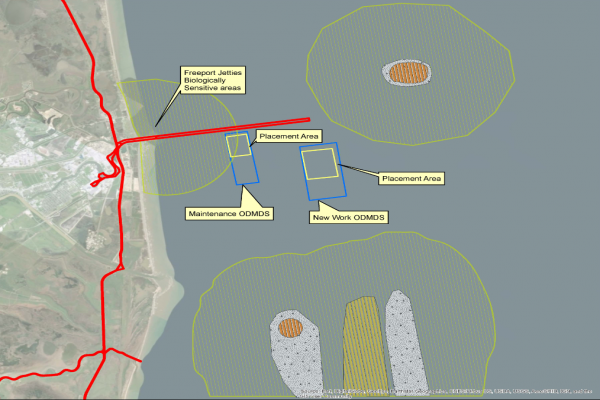 ANAMAR was contracted by USACE to research and predict the possible effects of expansion of the existing placement area at the Freeport Harbor Maintenance Ocean Dredged Material Disposal Site (Maintenance ODMDS) on nearby sensitive aquatic resources. The ODMDS is rectangular, measures 12,500 by 4,500 feet (1.5 nmi2) and is located approximately 2.6 nmi offshore of Freeport Harbor. The current placement area within the ODMDS measures 4,000 by 5,000 feet. ANAMAR reviewed and summarized available data relevant to the proposed expansion of the placement area. These data were focused on known characteristics of the ODMDS, the results of previous surveys, biologically sensitive resources identified off Freeport (e.g., reefs, fishing areas, white shrimp spawning sites), regional data on fisheries independent monitoring and commercial and recreational fisheries catches, endangered aquatic species and critical habitat, marine mammals, and Essential Fish Habitat. ANAMAR also generated sediment transport modeling results using the program short-term fate (STFATE) to help predict possible effects to sensitive aquatic resources from the proposed expansion of the placement area. The STFATE parameters were expanded to allow predictions of effects down current of the ODMDS. Various disposal scenarios were modeled using 4-hour and 24-hour durations, currents of 0.10 to 0.65 knots, and hopper dredging and mechanical dredging methods. The results were discussed in the technical memorandum that was provided to USACE and finalized in November 2018, well ahead of schedule. Overall, the results of the study suggest that the proposed expansion of the placement area appears to meet Marine Protection Research and Sanctuaries Act Section requirements 102(c)(3)(D). Based on the information and conclusions provided in the technical memo, EPA agreed to allow the expansion of the placement area within the ODMDS. This provides increased capacity to help meet both federal and private users’ disposal needs.AMAR also generated sediment transport modeling results using the program short-term fate (STFATE) to help predict possible effects to sensitive aquatic resources from the proposed expansion of the placement area. The STFATE parameters were expanded to allow predictions of effects down current of the ODMDS. Various disposal scenarios were modeled using 4-hour and 24-hour durations, currents of 0.10 to 0.65 knots, and hopper dredging and mechanical dredging methods. The results were discussed in the technical memorandum that was provided to USACE and finalized in November 2018, well ahead of schedule. Overall, the results of the study suggest that the proposed expansion of the placement area appears to meet Marine Protection Research and Sanctuaries Act Section requirements 102(c)(3)(D). Based on the information and conclusions provided in the technical memo, EPA agreed to allow the expansion of the placement area within the ODMDS. This provides increased capacity to help meet both federal and private users’ disposal needs.